Helping people tackle addictions to drugs and alcohol, learning to cope with life’s stressors and addressing underlying issues make up substance abuse counseling’s core mission. Counselors start by evaluating an addicted person’s physical, mental, emotional, and social behaviors. This is the first step in determining the appropriate treatment plans for each individual patient. Addiction counseling has many facets and they are listed below. At our drug and alcohol treatment center in Pennsylvania, every patient is assigned one counselor to manage their treatment plans, aftercare plans, and other circumstances, such as family relationships, legal issues, and contacting employers. Every counselor at Clearbrook is certified in addiction counseling. Many of our primary counselors are in recovery themselves or are recovering family members, giving them the necessary understanding and knowledge of the 12-steps, which they utilize when caring for patients. Their recovery allows for the empathy and personal experience to be passed on in a one-on-one setting, where the patient can feel safe in a private environment. Click here to view our clinical staff. One-on-one therapy is beneficial for a multitude of reasons. While engaging in individual therapy, you will begin to establish a relationship with your primary counselor. By doing so, you will learn the value of building relationships, creating healthy boundaries and most importantly, the importance of learning to trust another person which is all crucial to the recovery journey. It also allows for you to discuss issues you may not feel comfortable talking about in a group setting. Oftentimes, there are underlying issues that need to be confronted in order to have a successful recovery. Those circumstances can include a number of things, but some may include grief or trauma. In addition, individual therapy is helpful for those who are suffering from a dual diagnosis – someone who is suffering a mental illness in addition to a drug/alcohol addiction. That’s because a disease such as depression or bipolar disorder needs special treatment that is separate from counseling for addiction treatment. Throughout the day, our patients meet in a myriad of different groups together. This allows the patient to interact with the rest of the community and begin to develop the skill of getting help from other people that are in recovery. Also, group therapy is essential in the treatment process, because it gives the patient something and someone to relate to. While establishing a relationship with their counselor is important, many times it is most helpful for a patient to hear how their peers feel and what they are doing to overcome those problems. 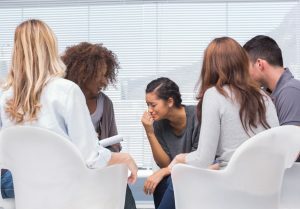 Group therapy and the patient community are fundamental in the early recovery process. Addiction is usually centered on isolation. Group therapy enforces the fact that you are not alone in the way you feel. Groups such as small groups, grief, gender separation, clinical lectures, detox/beginner’s group, and art and music therapy are some of the groups that our patients will participate in. When a patient leaves Clearbrook, we ask that they get involved in one of the 12-step fellowships. The 12-step recovery process has been around for more than 70 years, and it offers the patient the best way to take a look at their lives. Stopping using drugs and alcohol is the number one priority in anyone’s recovery, but more is required if one wants to achieve continued sobriety and ultimately have a better way of life. With that said, changing behaviors, looking inside one’s self, repairing the damage done, and helping another suffering addict is the best prescription for someone to not return to their unhealthy ways through addiction. Members of the different 12-step recovery groups come to Clearbrook multiple times per week to put on meetings for our patients. This allows our patient community to interact with people who have gotten through treatment and adopted the 12-step process of life. It shows our patients that recovery is possible if you are willing to put forth the strength and hard work that is required to stay sober. Our addiction counseling services in Pennsylvania have successfully allowed so many individuals to live a happier and healthier lifestyle in recovery.